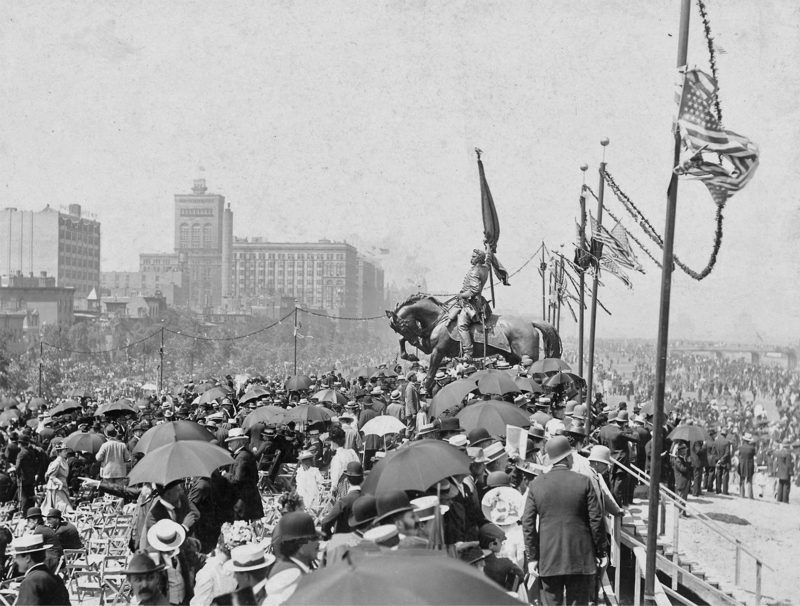 July 22, 1897: The formal ceremonies dedicating the Logan Monument in Grant Park are held, beginning a 1 p.m. After the two-hour dedication ceremony, guns sound on the shore and from ships on the lake, and a parade of 10,000 marchers begins at Twelfth Street and Michigan Avenue and moves north on Randolph, west to State, south to Adams, west to Dearborn, north to Washington, west to La Salle, south to Jackson, finally ending at Michigan Avenue. Mrs. Logan, the general’s widow, is received that evening at the Coliseum with a fireworks display and band concert preceding that event. 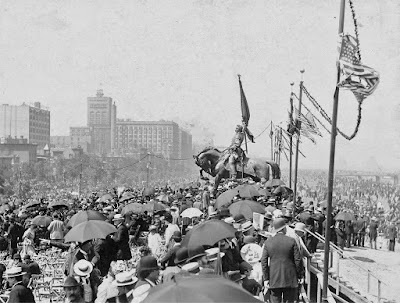 Of Augustus St. Gaudens’ equestrian statue of General Logan, the Chicago Daily Tribune writes, “In the statue of General Logan St. Gaudens has chosen as the dominant idea the expression of courage, the martial courage, which is born of patriotism and indomitable will.” The above photo shows the dedication ceremony that July day in 1897.